Having problem skin can range anywhere from a temporary and minor inconvenience to a life-changing condition that can be accompanied by severe psychological distress, even depression. It can be difficult to face the world and fulfill your maximum potential in life, especially when you are not comfortable in your own skin and worry about the judgements that others may make about you. Whether it is acne, burns, post-operative scarring, or other unresolved skin conditions, our lasers have the ability to target many different pathologies by utilizing specific wavelengths of light. Figure 1. Illustration of acne treatment with red and blue light: “Red and blue light when used in combination have synergistic effects in treatment of acne. P. acnes synthesizes and stores a large amount of porphyrins. Once the porphyrin is exposed to visible light (specifically blue light) it becomes chemically active and transfers to an excited state, resulting in formation of reactive free radicals and singlet oxygen which in turn causes membrane damage in P. acnes. Red light is proposed to exert its effects through reducing the inflammatory process.” Source: Avci, P., Gupta, A., Sadasivam, M., Vecchio, D., Pam, Z., Pam, N., & Hamblin, M. R. (2013). Low-level laser (light) therapy (LLLT) in skin: stimulating, healing, restoring. Seminars in Cutaneous Medicine and Surgery, 32(1), 41–52. 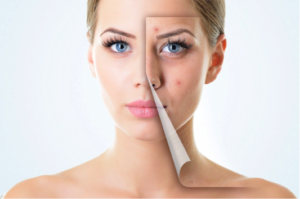 Acne is a chronic disease of the pilosebaceous follicle, affecting 8 out of 10 people at some point in their life. While many people do not respond well to conventional treatment or suffer undesirable side effects from medication, recent advancements in light therapy have shown promising results. Studies show that short wavelengths of light have the ability to destroy Propionibacterium acnes, the bacterium associated with acne vulgaris, while longer wavelengths of light have the ability to penetrate deep into the skin to affect the secretion of sebum, as well as the activation of anti-inflammatory pathways to decrease the inflammation and pain associated with acne. Other research, including works published in Seminars in Cutaneous Medicine and Surgery, indicate that Low-Level Laser Therapy (LLLT) can effectively improve wrinkles and skin laxity, increase collagen synthesis, increase vascular perfusion, increase platelet-derived growth factor, and inhibit apoptosis (cell death). Together, these cellular effects and others have been shown to stimulate cellular proliferation for wound closure, decrease the severity and occurrence of blemished skin, and mitigate any associated pain and inflammation. Figure2. Mechanism of actions for LLLT’s effects on skin rejuvenation: “LLLT aids skin rejuvenation through increasing collagen production and decreasing collagen degradation. 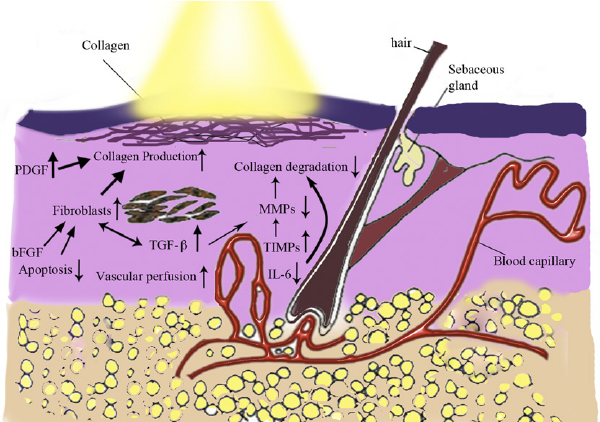 Increase in collagen production occurs by LLLT’s increasing effects on PDGF and fibroblast production which happens through decreasing apoptosis, increasing vascular perfusion, bFGF and TGF-β. Decrease in IL-6, and increase in TIMPs which in turn reduce MMPs all aid in reduction of collagen degradation.” Source: Avci, P., Gupta, A., Sadasivam, M., Vecchio, D., Pam, Z., Pam, N., & Hamblin, M. R. (2013). Low-level laser (light) therapy (LLLT) in skin: stimulating, healing, restoring. Seminars in Cutaneous Medicine and Surgery, 32(1), 41–52. You will first meet with our doctor to discuss your health concerns and goals, and to establish a personalized care plan. You can also expect that your laser treatments will be completely pain-free. Administered by one of our educated and well-trained technicians, treatments take 10-20 minutes and should be applied two or more times a week. The duration of your treatment program depends upon the severity of the condition. While some patients notice improvements after only a few treatments, more severe cases may take up to 10-12 treatments before substantial progress is made. At this point, we will work to scale back the number of treatments necessary for you to remain blemish free. See our flexible payment options below! Meet with our Medical Director to discuss your health concerns & develop your personalized wellness plan as well as your 1st laser session. We understand that improving and maintaining one’s health often present’s financial challenges. This is why we have partnered with PayPal to offer you No Payments + No Interest if paid within 6 months!